Isotech, Inc. offers turnkey testing chamber systems for 5G Testing, mmWave Testing, EMI/EMC Testing, and RF Testing. 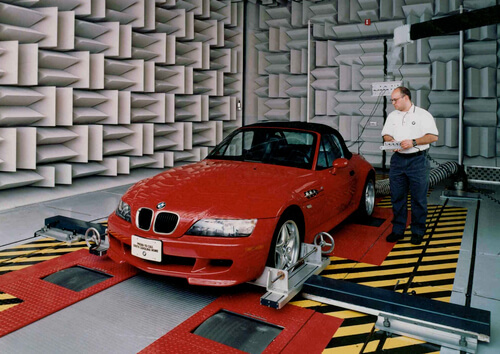 We provide state-of-the-art Antenna measurement system with cutting edge customized and standard size Anechoic chambers for the Academic, Commercial, Automotive, Research, and Defense sectors. Isotech, Inc. offers new generation shielding systems that are made up of robust premium grade raw material fabricated using modern technology along with high quality ventilation and heating systems for efficient shielding against electromagnetic waves and designed to ensure excellent compliance with industry standards. Isotech, Inc. also offers Polypropylene Hybrid Absorbers, Foam Absorbers, all type of RF Shielded Doors (PAN type and Sandwich type), Honeycombs, Filters, Joint Gaskets and other Anechoic material. All power supply lines, fire and security alarms are filtered, and wiring layout within the premise is performed in tubes or shielded covering. RF Shielded Boxes that are widely demanded among our clients. These are manually operated shield boxes, which are known for their features like long life, high RF field attenuation and wide usable bandwidth. Offered with optional built-in test fixture and antenna coupler, the units of the boxes can be customized to meet the clients’ data and RF connection needs. Moreover, these shielded boxes are ideal for testing 802.11a and 802.11b cards and mobile phones along with WAN, PCMCIA, PCI and Bluetooth PCBs.